What about an early 1975-80 240? 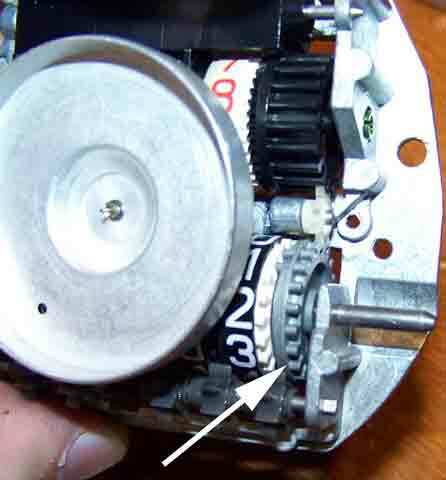 Regarding early 240 models (1975-80), the speedo internal parts are similar and you may use these same gears as fitted to the 1981-85 240. Broken odometers in Volvo 240s are pretty common. Luckily, for most of us, there are now easy fixes for little nuisances like this. 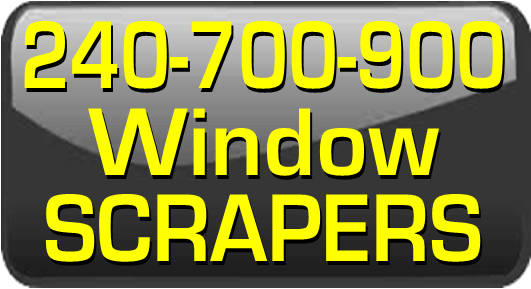 And there are even a few good webpages covering such repairs. So... why did I go to all trouble of writing this page then? A couple reasons... When I experienced a problem with the odometer in my '84 242 Turbo, I found it to be COMPLETELY DIFFERENT from any repair I've seen before, resulting in no new parts needed (at first). Then I started getting emails from people who found this repair page. Often they had bought and tried to install a new gear from an on-line seller. A LOT of people were getting badly confused by the two very different installation methods between cable-driven and electronic speedometers and the lack of accurate guidance they were finding on-line. And I found that lots of 240 owners even had no clue if their speedometer was cable-driven or electronic. And they were frustrated by poor advice they were getting from people who sold them odometer gears. So I put together some very detailed instructions below on BOTH types of repairs for 240s. Replacement Speedo Needles: Yamahapro on the Turbobricks forum supplies hard to find used speedometer needles for 240 speedos. This is good news in case you break one. 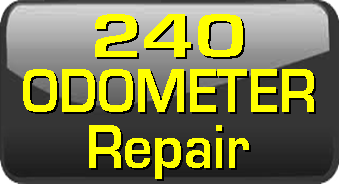 He will also be supplying good used odometer reset buttons (1384775), since those get broken often enough too. He may be contacted through Turbobricks or directly at chaseryan13 [at] gmail [dot] com. Wagonmeister.com offers repair services for 240 instrument clusters and rebuilt 240 clusters among many other cool parts and services like LED bulbs for your gauges. Located in Southern California. 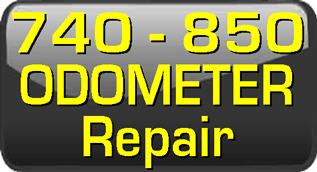 Overseas Speedometer: Overseas Speedometer in Austin, Texas offers repairs for electric and cable speedometers. Many makes including Volvo. They can also repair most 240 clocks for a moderate fee. 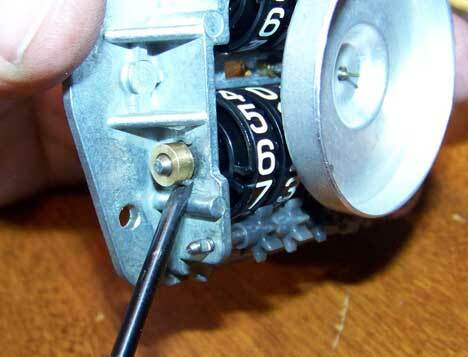 Section 1: General Odometer Surgery & Repair. 1981-1985 240 CABLE-DRIVEN (mechanical) Speedometers. ALL Types; MPH and km/h. These instructions ALSO correspond to 1975-80 240/260 models. I offer the following (mechanical) 240 gears for sale. New Nylon Gear: $16.00 each -- 11, 14, 15, 16, 17 or 18 tooth - for 240 Mechanical Speedo (please verify your tooth count). This gear replaces your broken "outside gear" as shown in the above instructions. At this time I keep on hand the 11, 14, 15, 16, 17 and 18 tooth gears, since these are the most common. 1981-85 240: A 14 tooth is the most common so far found in USA cars. A 15 tooth gear was found in an '83 240 Turbo believed to have been from Canada. The 11 tooth is very common in European cars and has been found in Australian and Canadian 240s. 1975-80 240: The 18 tooth is most often found in these early models, however the 16 tooth gear has also been found. And so far one 17 tooth gear has been found in a 1975 model in the U.K. NOTE: A larger tooth gear will slight slow the odometer and a smaller tooth gear will speed it up. I can also get any other size gear you might need if you can wait a few extra days. If you find a gear in your 240/260 other than an 11, 14, 15, 16, 17 or 18 tooth, please let me know. If other gears are commonly found, I will begin stocking more tooth counts. New "Lead" Gear: $16.00 each. Replacement for the gray metal gear. "1/8 inch" size is offered below (actual thickness is about 4.5 mm). This is the most common size found. Three sizes exist: 1/8 inch (4.5 mm), 3/16 inch (5.4 mm), and 1/4 inch (6.3 mm). 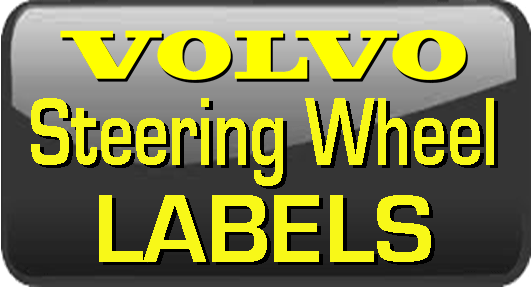 At this time I only stock the 1/8 inch "lead" gear, since it has been the ONLY one requested by any Volvo owner over the years. I can get any other gear if needed. 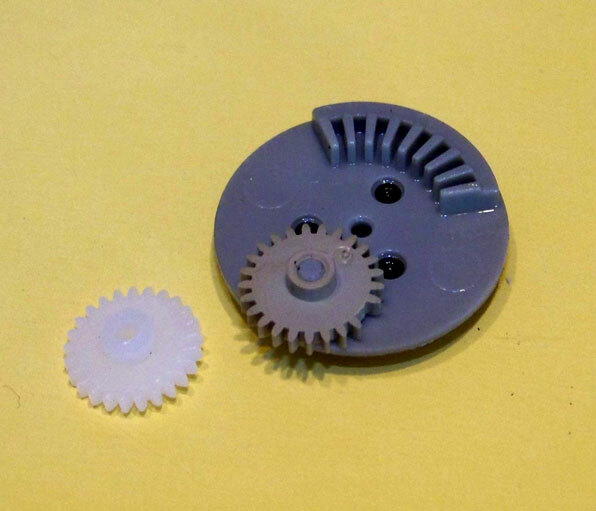 If you find this gear in a thickness other than the 1/8 inch (4.5 mm) size, please let me know. If other gear thicknesses are needed by customers, I will begin stocking other sizes. Click View Cart to see the Cart or to Check Out. For these instructions below, I will not go into detail about removing the 240 instrument cluster from the dash. 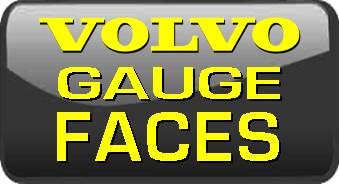 For detailed instructions on that part, you may refer to my 240 gauge face installation instructions at https://www.davebarton.com/pdf/240faceinstall81-93.pdf. Here's the back of your typical 1981-1985 240 instrument cluster. 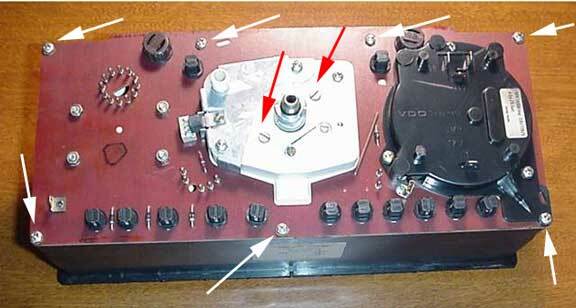 <<< Locate and remove the 7 Phillips head screws around the outer edge (noted by the white arrows). 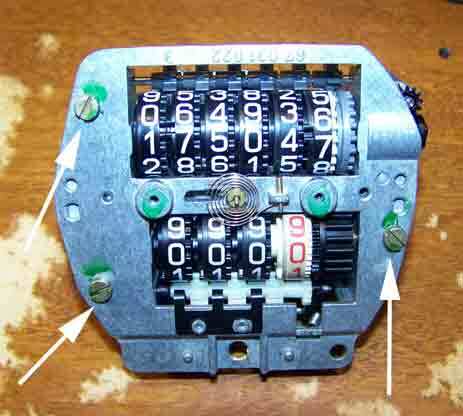 <<< Also remove the two slotted screws on the back of speedometer (noted by two red arrows). <<< Some speedometers have these additional electronic connections. If yours does, then remove the smaller slotted screws shown. Next step: Lift out the circuit board from the instrument cluster box. <<< After lfting out the circuit board, here's what you will now see. The speedometer remains in the box. 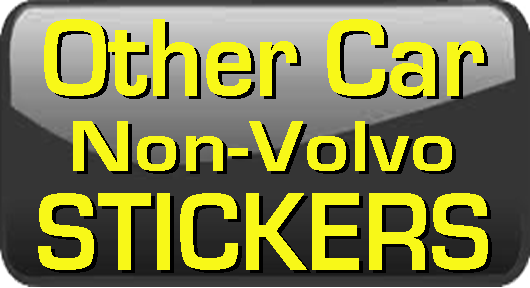 <<< If your cluster has a tachometer, you'll see this little item indicated by the arrow. Don't lose it. It will fall out if you turn the box over. 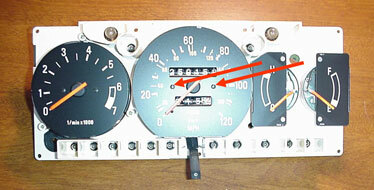 On the 1981-'85 240, the speedometer needle needs to be removed. This is a delicate operation. <<< Here is the back side of your speedo. Look for two rectangular slotted holes. One on each side. One is indicated by the screwdriver in this photo. <<< Insert a small slotted screwdriver (like the one shown) into one of the holes. This will lock the speed cup and the mechanism inside the speedometer so it can't spin. This way the needle shaft cannot turn. <<< In the next step you'll be removing the needle, but first you will be gently lifting the end of the needle up and over the ZERO stop pin. When you do that, take note of the little mark shown in this photo. It's a resting position mark that the factory used when assembling this speedometer. <<< After gently lifting the needle over the ZERO stop pin, release it and take note of its resting position. It will likely be pointing at the little mark in the above photo. When you reinstall the needle later, you should use the same position. This way your speedo needle will be in the same place after you're done. NEEDLE REMOVAL: To remove the needle, grip the center plastic hub of the speedo needle and turn the needle counter-clockwise (toward the "MPH"). Be careful not to put pressure on the thin orange plastic needle pointer. It can snap off in a generally unpleasant way if you do. The factory used a liquid glue (similar to Locktite) to glue the needle onto the shaft. 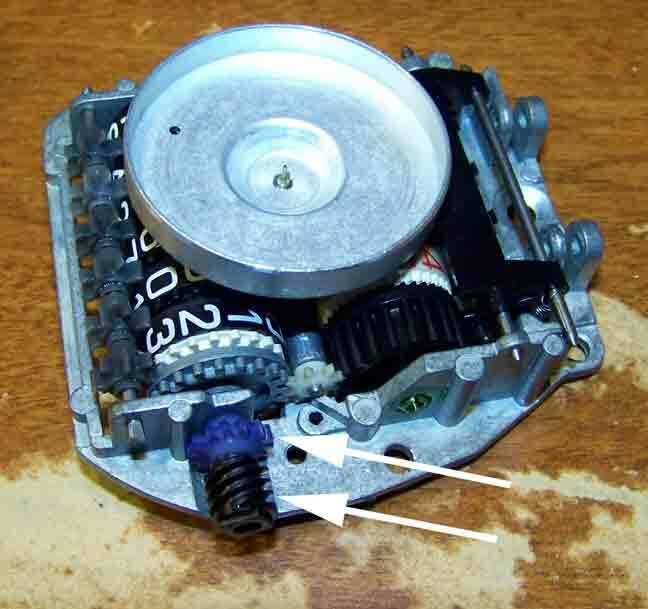 Since the internal mechanism inside the speedometer was already locked by you, you will be turning and forcing the needle counter-clockwise until you feel it come loose and get easier to turn. You may feel the glue break loose. Once that happens, now you may turn it back and forth to further loosen it, while at the same time gently pulling it toward you. It'll soon come off in your hand without any fuss. 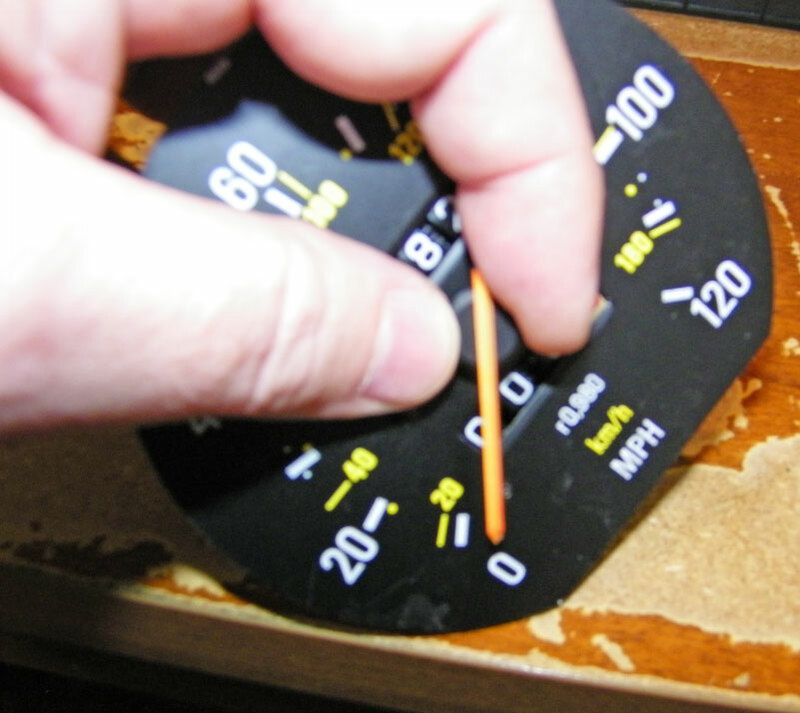 In the unlikely event that you break a speedometer needle, there is a supplier of these listed in the "Resources" section near the top of this page. 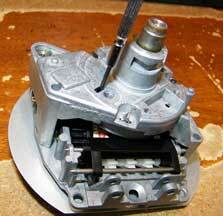 <<< Once the needle is off, remove the metal speedometer faceplate using a small flat screwdriver. To do this, remove the 2 tiny screws. Be careful if they're tight. The factory likes to put threadlocker on them. These screws are soft metal and are easy to gouge. Find a screwdriver that fits these small slotted screws well. 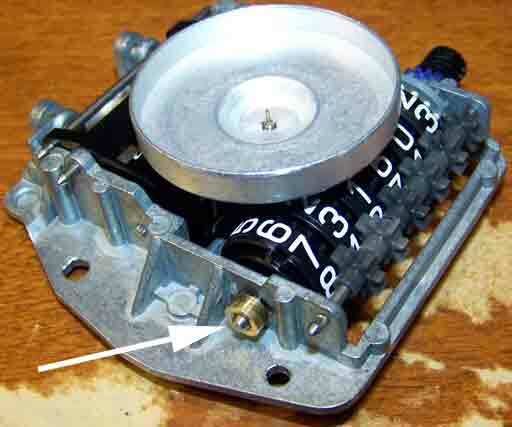 <<< Here's the naked speedometer after removing the faceplate. See those 3 slotted screws? Enlarge the pic and you can see better. Remove them. They hold the two halves of the speedo together. Once the screws are removed, be gentle when pulling it apart. The parts inside are delicate, but it won't explode in a shower of parts... trust me. You'll see one piece (below photo) that can fall out at this point. Not to worry, just put it back like shown in the photo. Here's the back half of the speedo. 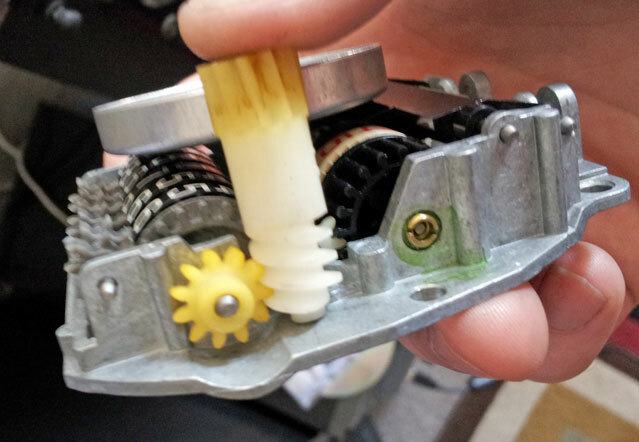 <<< The long white gear indicated by the arrow is what I was talking about. It will fall out easily. Just be sure to put it back before you reassemble. Here's the front half of the speedometer, viewed from the back side. <<< See these two gears indicated by arrows? 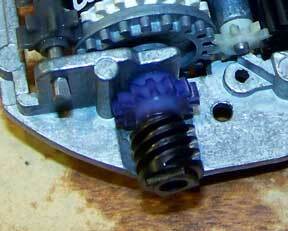 In this photo one is BLUE and one is a black spiral gear. To avoid confusion, I'll call these "outside gears" since they're on the outside of the odometer frame assembly. Not all speedometers will have that black spiral gear. It's only found in cars with an interval engine service light in the dash. 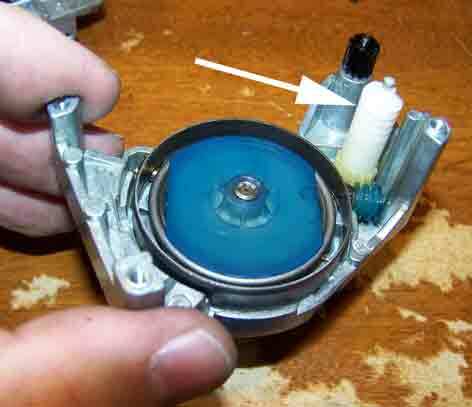 This BLUE gear (yours may be a different color) is most often the culprit for a failed odometer (but not always). I now offer replacements for this gear if you need one. The outside gears I have for sale in this section will replace this one. You may notice in this photo the odometer reset button is missing from the bottom of the speedometer. I removed it so it wouldn't get in my way. It pops off quite easily. They also tend to break after years of getting pushed and pushed. Replacements can usually be found for sale online, but I don't offer them. <<< NOTE: Here's something that's a little different. 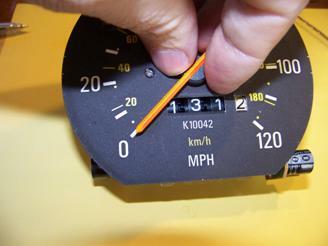 This particular speedo is from a 1984 240 Turbo in Europe. 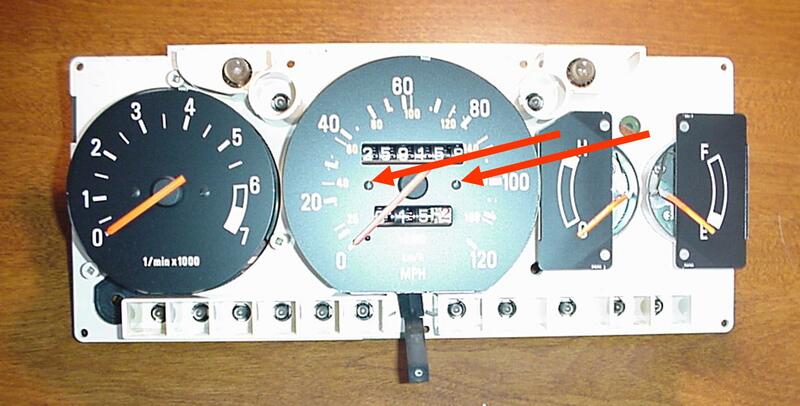 Comparing to the speedometer shown above, this speedo only has ONE outside gear and no black spiral gear. This car was not equipped with an interval engine service light in the dash. This outside gear looks to be yellow or white and has 11 teeth. So far I have heard of this 11 tooth gear only being found in Europe and Australia. <<< Here's another speedometer that is a bit different. This is a 1975 240 speedometer found in the U.K. It has a 17 tooth gear that has split. <<< Here's a closer look at that BLUE gear. Your gear may be a different color. This gear can have a tendancy to crack or become stripped on the shaft. It might also lose teeth after years of use. There is a long metal shaft going through these two outside gears. In order for the odometer to function correctly, these gears need to grip the shaft... so slipping is NOT allowed. When I was working on MY speedometer, I found nothing obviously wrong with either of these outside gears. No cracks and no missing teeth. And they appeared to be gripping the shaft from what I could see. This was a mystery, since my odometer clearly was not working. So I gave up. It's not my fault Volvo owners give up so easily. NO! 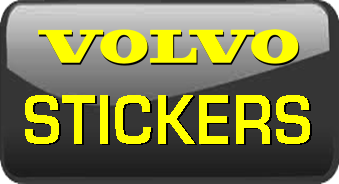 Volvo 240 owners are NOT quitters! I hope you didn't fall for that. Instead, I found a way to test the odometer to see where my problem was. As I mentioned, that blue gear could be cracked, missing teeth or just plain slipping on the shaft, although I could find no problem with it at this point. I needed to see for certain if that gear was gripping or slipping on the shaft. To test this, pick up the assembly and grip the wide black inside gear (like I am in the photo) and hold it so it can't turn. Now see if you can turn the two outside gears on the end of the shaft. Don't force them.... be gentle. You should NOT be able to turn the two outside gears without the wide black inside gear turning also. If you can spin the outer gears without the inside gear turning, you know something is slipping somewhere. It's important to find out exactly what is slipping before you pull anything apart. If you find the blue (or whatever color) plastic outside gear is slipping, your best solution is probably to replace it. Some have been was successful in gluing them, but that was before new replacements were available. <<< See this brass collar? It's pressed onto the shaft (opposite end from the outside gears). This shaft goes through the odometer number wheels and through the two outside gears on the other side. When you try to spin the outside gears (while holding the wide black inside gear steady), have a look at this collar to see if the shaft/collar is spinning along with them. If the shaft is NOT spinning, then one or both outside gears are loose (that is bad). If the shaft/collar IS spinning and it still appears the outside gears are gripping the shaft, then something else is slipping. Don't worry. I'll cover this situation a little further below, so don't be a cheater and skip ahead. <<< REMOVING THE OUTSIDE GEARS: If you find you need to remove the outside gears, gently pry them with a small flat screwdriver (see photo). I don't know if it matters, but for now pay close attention to which direction they face, so you can put them back on the same way. <<< For those of you who don't read directions very well, here's a close up of these gears. NOTE: The tops of these gears in the photo were facing away from the speedo body. Maybe that will help those of you who weren't paying attention to the positions of your outside gears (assuming it really matters). 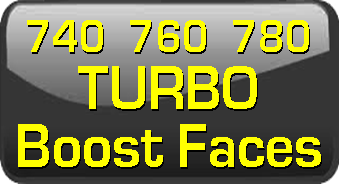 <<< I found this blue gear to have 14 teeth and it may be typical of many U.S. 1981-85 240 Turbos like mine. I offer new replacements for this gear in several different tooth counts if you need one. Please scroll down to the bottom of this section. If you need a new gear, you should replace yours with the same tooth count to match. If you found that one or both of your outside gears were spinning on the shaft, and the gear is not otherwise broken, you could try roughing up the shaft with some sandpaper, although I have not tried this and cannot say if it will help. It's also possible to use a small punch or screwdriver to tap small dents around the gear center hole. This might help close up the hole slightly. Be careful, since beating on your gear may destroy it. With it being so old, it might also be brittle. You will have to decide on the risk. Remember? You're a decisive 240 owner! However, if a new gear is available, I would stop screwing around and just buy a new one. When I tested my outside gears to see if they were gripping or spinning on the shaft, I found they were gripping quite well, but they were spinning the shaft when I turned them while I held the wide black inside gear steady. That was not the way it needed to be. As it turned out, my outside gears were just fine. What I discovered was that the GRAY METAL GEAR you see in this photo was slipping on the shaft. 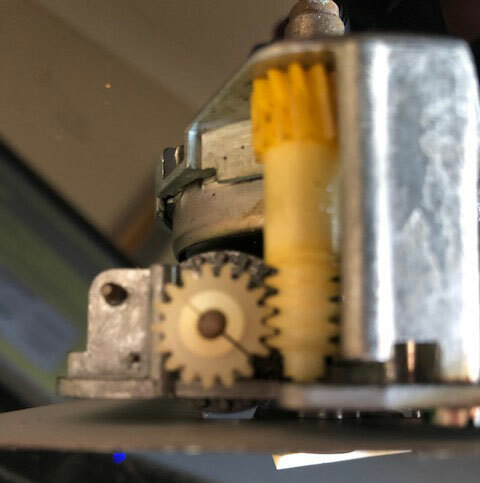 It's an inside gear. And it's supposed to GRIP the shaft. Slipping is bad. Removing this metal gear is a bit trickier. <<< See the shaft going through the gear? Remember how it goes through all the odometer number wheels too? If you remove this shaft, the odometer will explode and a lot of little parts will fall out and bounce everywhere. Not good. I found a way. The shaft needs to be pulled out just enough to release that metal gear. The last thing I wanted to see was all those little number wheels falling out, or even moving in the slightest amount. So I placed a piece of packing tape across the number wheels (see photo) to keep them snugly together. No moving. Much, much better. <<< Then I used a felt marker and marked both the gray metal gear and the white plastic one next to it. I wanted the gray metal gear to go back in the exact same position, just in case it made a difference. 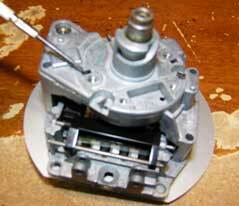 <<< First, remove those two outside gears. This was discussed a few steps up. <<< Then, to slide the shaft out, use a small screwdriver to pry under this brass collar. The collar and shaft are pressed together as one piece. Let them stay that way. The shaft and collar should begin coming out slowly. Work slowly. DO NOT pry the shaft out too far. Pry the shaft out just enough so the gray metal gear is free. Then carefully lift the gear out. Try not to disturb the odometer number wheels. <<< Here's the gray metal gear after I removed it from my speedometer. This one is 1/8th inch thick (4.57 mm). 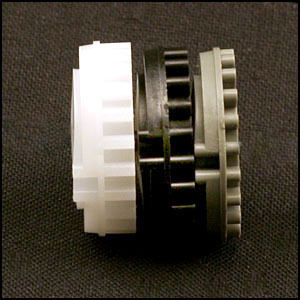 Take note that this gear may be found in three different thicknesses: 1/8 inch (4.57 mm), 3/16 inch (5.44 mm), or 1/4 inch (6.35 mm). The most common one so far that I have seen is the 1/8 inch gear. This gear is made of metal, with the appearance of "lead," so it is commonly called a "lead gear." If you look very closely, the hole in the center has some very faint splines. ON MY GEAR these splines were worn down smooth, so it was slipping on the shaft. My solution to tighten up this gear on the shaft was to use a pointed tool (a nail punch or small screwdriver may work) and give the area around the hole a few taps to slightly deform or expand the metal and tighten the grip on the shaft. Three taps on mine worked. The gear went back on and was nice and tight, but after a while it began slipping again. Since a new replacement gear is available, I went back in and replaced it with a new one. These are available below. Please scroll down to the bottom of this section. <<< After you re-insert the gray metal gear, push the shaft back through and test the odometer function again before installing the outside gears. Pay attention to the alignment of the top odometer numbers. The first time I re-installed the gray metal gear, I found the far right number wheel was no longer aligned (see photo). This means I allowed that number wheel to slip a little. I pulled the shaft back out again and realigned that odometer wheel. Now I have a perfect odometer again. 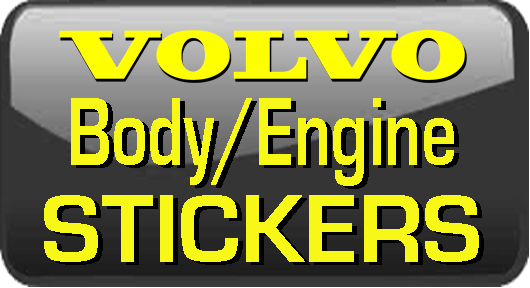 <<< Here's something NEW I discovered while repairing one of my 240s. After re-tightening these three screws (shown by white arrows) and after placing the speedo needle back on, I found that the speed cup mechanism was somehow jamming inside, but it would only occur when these three screws were all tight. If I loosened these screws slightly, the needle and shaft would rotate nicely with no binding. So it appears it is possible to over-tighten things and make the mechanism bind. It's probably a rare thing, but keep this in mind. I didn't think it would be a good idea to run it with the loose screws, so my solution was three very, very thin washers placed between the two halves. Then I could tighten the three screws and it all worked perfectly. Another solution could be to use some thread-lock compound on the threads. <<< Now re-install the face and speedo needle. NEEDLE INSTALLATION: When re-installing the speedo needle, make sure you gently push down evenly on the center hub of the needle. Once it is on firmly enough, if adjustment is needed, you may adjust it to its former position by using the small screwdriver trick to lock the speed cup as discussed earlier. 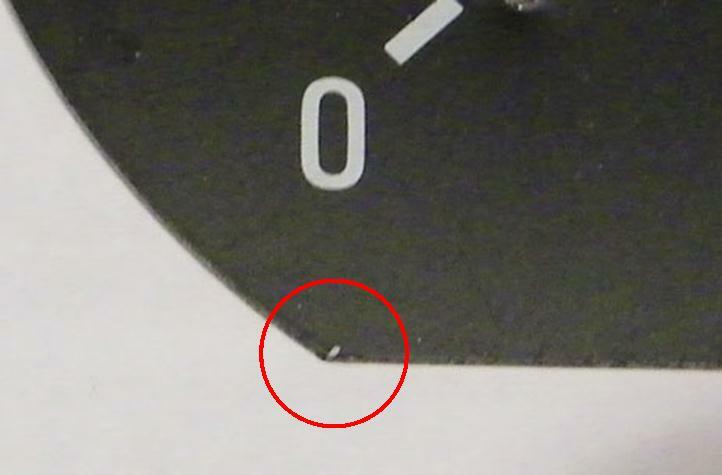 If you forgot to check its former position, you should know that most mechanical speedometer faces will have a small mark on the edge, just below the needle. Point it at that mark if you can see it. That should be where the factory set it. Total installation time, after removing the instrument cluster out of my car, was less than an hour. Why don't you fix yours now? It's rare that a mechanical speedo continues to have mysterious problems after successful gear surgery, but strange things can happen to 30 year old speedometers. The below situation was shared by Justin S. after his odometer stopped intermittently after replacing a bad gear. "After taking a break to clear my head, I went back and spent some time observing the odometer while I spinned the gears to see if I could discern where the problem was. After a while I figured it out. I noticed that the last odometer digit was slightly binding on the top gray plastic gear and the metal inside gear when it went to turn over a new mile. Then, I checked the shaft that the outside gears are on that runs through all of the odometer numbers and out the other side. It had quite a bit of play to where you could move it back and forth slightly. I noticed that it needed to tighten up just a fraction to prevent the binding. So, I pushed the outside gears down on the shaft just a tad and it tightened up the play on the shaft a fraction. This was enough to allow the odometer to run smoothly every time it went to turn over a new mile. I was able to put it all back together and reinstall the instrument cluster back in my car. I went for a 20 mile test drive and the odometer ran perfectly smoothly. I am not sure how the shaft became so loose, but maybe what I found will be helpful to you or someone else one day. It could be that it just loosened up over time as my 240 is 28 years old and has 386,000 miles." NOTE: A larger tooth gear will slightly slow the odometer and a smaller tooth gear will speed it up. 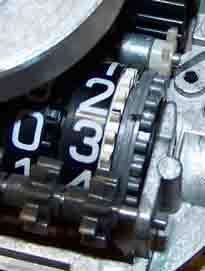 Section 2: General Odometer Surgery & Repair. I offer the following (electronic) 240 odometer gears for sale. New 25 Tooth Gear: $16.00 each. (240 1986-91 ALL, and MOST 1992-93 models). New 26 Tooth Gear: $16.00 each. (240 some 1992-93 models only). NOTE: CLICK HERE for special information regarding different gears found in 1992-93 240s. 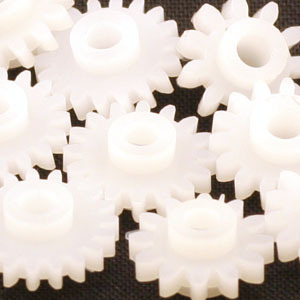 New 15 Tooth GEAR POD for ALL 1986-93 240: $16.00 each. 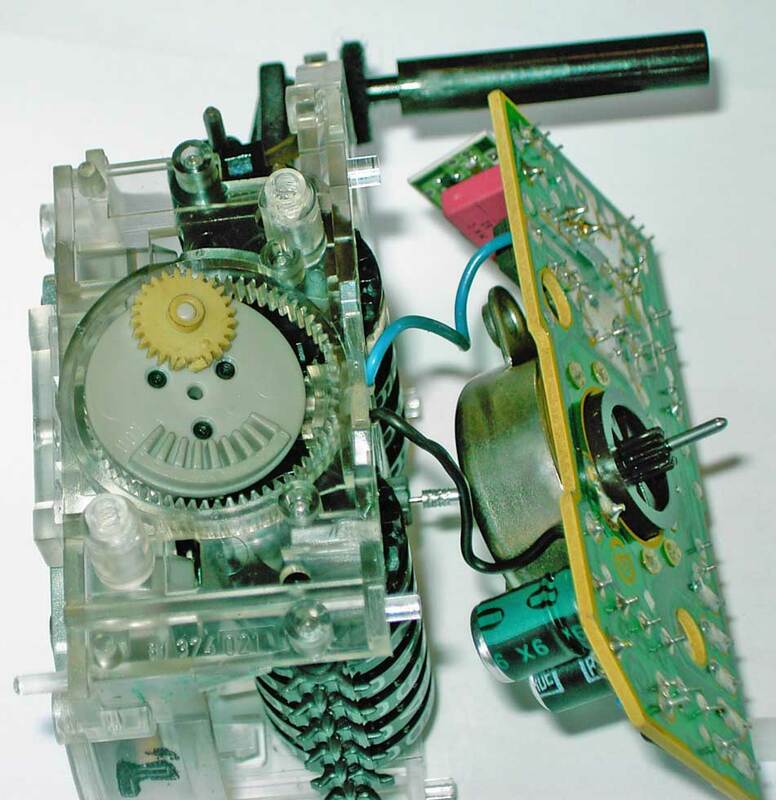 The original Volvo gear pod was made in two pieces (the pod disc and a 15 tooth gear were separate pieces). This new gear pod is made as one piece which ensures a stronger part. There are two different possible tooth count gears for the '92-'93 240. 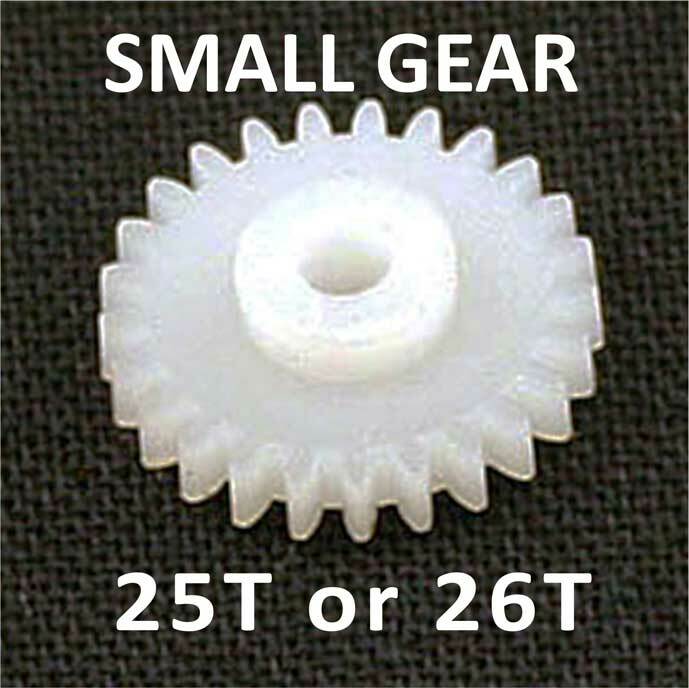 Most have a 25 tooth gear, although some have been found with a 26 tooth. So far as I know, the only way to tell for sure which one is in your '92-'93 240 is to open it up and count the teeth. If you don't want to go to the trouble, you may just install a 25 tooth gear. It will fit ALL units. Even if it turns out to be the wrong one, everything will still work just fine, but the odometer will be off by about 3% (less than 2 mph at 60). A larger gear will slow down the odometer while a smaller gear will speed it up. For this set of instructions below, I will not go into detail on removing the 240 instrument cluster from the dash. For detailed instructions on this part, please refer to my 240 gauge face installation instructions at https://www.davebarton.com/pdf/240faceinstall81-93.pdf. Or click the below YouTube video. 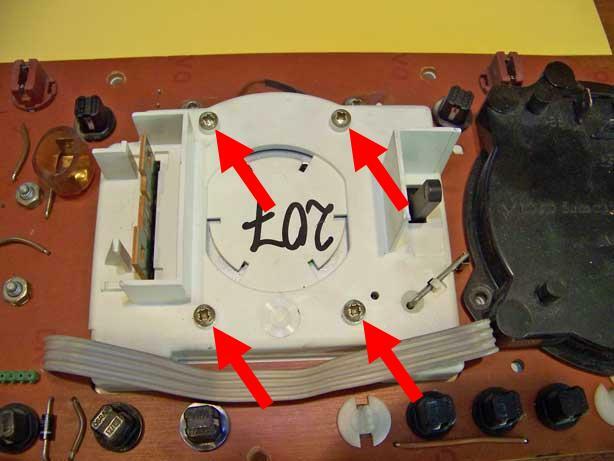 <<< Locate and remove the 7 Phillips head screws around the outer edge of the gauge box (white arrows). Ignore the red arrows in this photo. 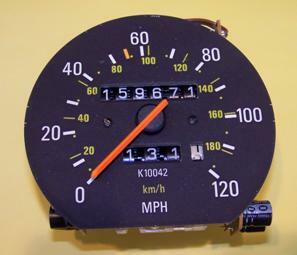 <<< Here's the back of the electronic speedometer in your cluster. Remove the 4 Slotted Screws noted by the red arrows. Lift the gauge and circuit board assembly out of the box and the speedo will easily separate from the rest of the assembly. 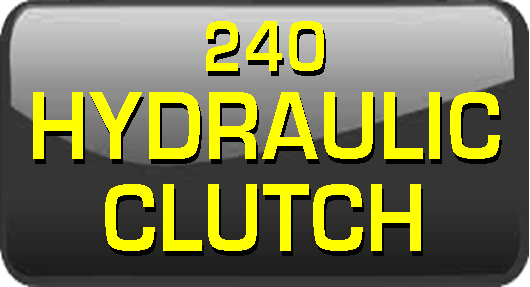 <<< If your cluster has a tach, you'll see this little item. Don't lose it. It will fall out if you turn the box over. So don't tip it over. <<< Here's the speedo after separating it from everything else. Exciting, huh? <<< There's a small electric motor in there. Behind that is the small plastic gear that breaks so often in '86-'93 240s. You will be removing these two Phillips screws soon. But before you do that, you have a decision. Most 240 owners are already decisive. Let's see if YOU are. The metal faceplate on the front of the speedo can get in the way of this operation. 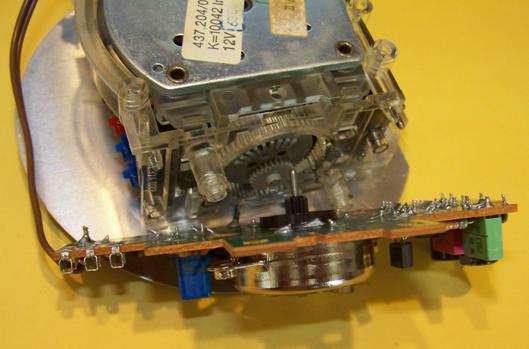 This procedure can be done WITHOUT removing the speedo needle and metal faceplate, but it may be a bit harder and more tight to work in there behind that motor and circuit board. The advantage of NOT removing the speedo needle is that it eliminates the chance of breaking it. <<< Have a look here. Not a lot of room, but it can be done. Decision time now . . . . Customer Recommendation: "Don't remove the needle. Remove only the two screws holding the faceplate. 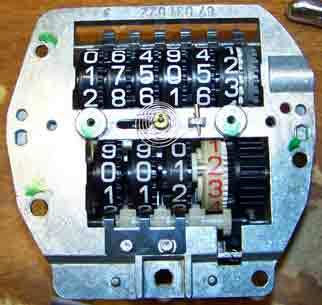 Then by rotating the faceplate counter-clockwise 90 degrees, the bottom (flat part) of the plate tucks in enough to work as if it were off. With the seasonal climate changes, these cars now 25 plus years old, the speedo needle can crumble if disturbed." Removing the faceplate screws: Unscrew and remove the two small faceplate screws. Use a small slotted screwdriver. It's important to use one that fits well in the slots. These screws are soft metal (brass) and will be gouged easily if you use the wrong size tool or too much force and slip. 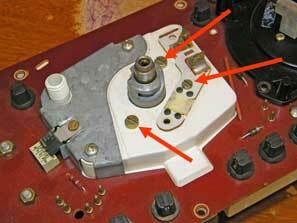 If you have decided to remove the needle and faceplate first, this step will tell you what to do. 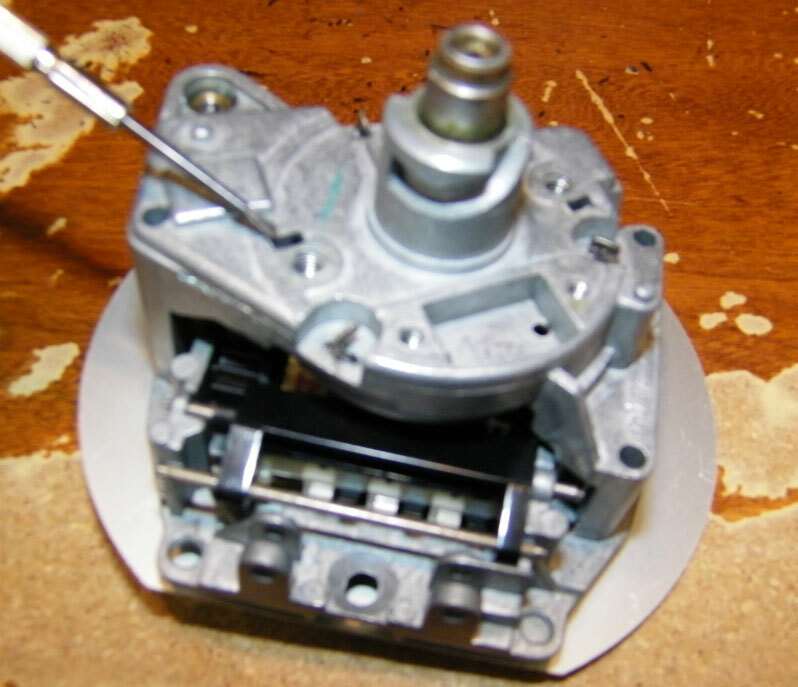 <<< Removing the Needle: Grip the center plastic hub of the speedo needle and turn it counter-clockwise (toward the "MPH"). Be careful not to put pressure on the orange needle pointer. It's brittle plastic and will snap off if you do. There is an INTERNAL STOP inside this speedometer that makes the needle stop are zero. You will be rotating it counter-clockwise and then CAREFULLY FORCING IT PAST ZERO. The needle shaft has a bit of glue holding it. After you feel the glue break free, the needle will turn past zero and it will get easier to turn. Continue turning it counter-clockwise, while at the same time gently pulling it toward you. It'll soon come off in your hand without any fuss. CAUTION: Do not put any sideways pressure on the thin metal shaft the needle is attached to as you twist. That shaft has been known to snap inside the speedometer in rare cases. If that happens, you may be looking for another speedometer. If this worries you too much, then go back to the previous step and do this without removing the needle. Click here to see how a customer repaired his speedo after this happened to him. 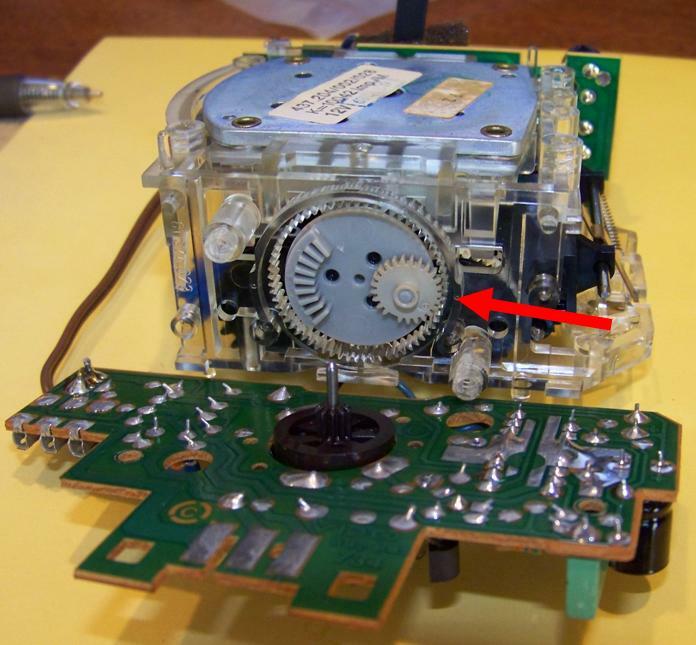 If you have removed the needle, now remove the faceplate screws. Using a small slotted screwdriver (it's important to use one that fits well in the slots), unscrew and remove the two small faceplate screws. These screws are a soft metal (brass) and will be gouged easily and distorted if you use the wrong size tool or too much force and slip. <<< Remember those two Phillips screws a few steps back? Remove them now if you haven't yet. <<< These photos show how it will look if the needle and faceplate are removed first. After the two Phillips screws are removed, pull back the circuit board assembly. When you pull back this circuit board, you will find one of two different possibilities. That gray gear contraption is the GEAR POD. The smaller gear is the 25 tooth gear. The pod might stay in the speedo case or it might stay attached to the circuit board and motor (as in next photo) . . . it doesn't matter. Either way is good. 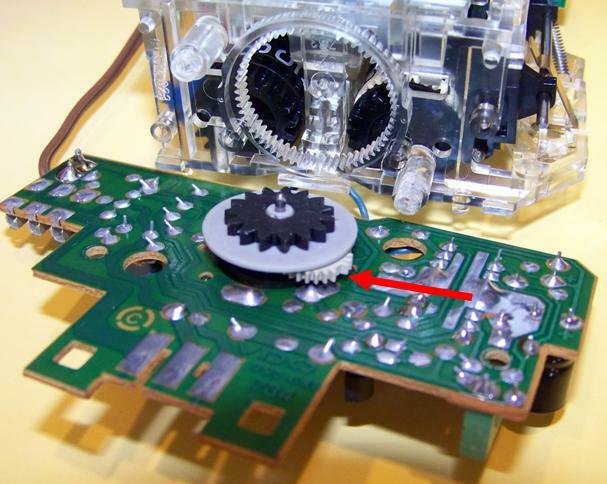 Noted by the red arrow: That small 25 tooth gear on the GEAR POD is the part that fails most often. If you look closely, the 25 tooth gear in this photo has a tooth missing. 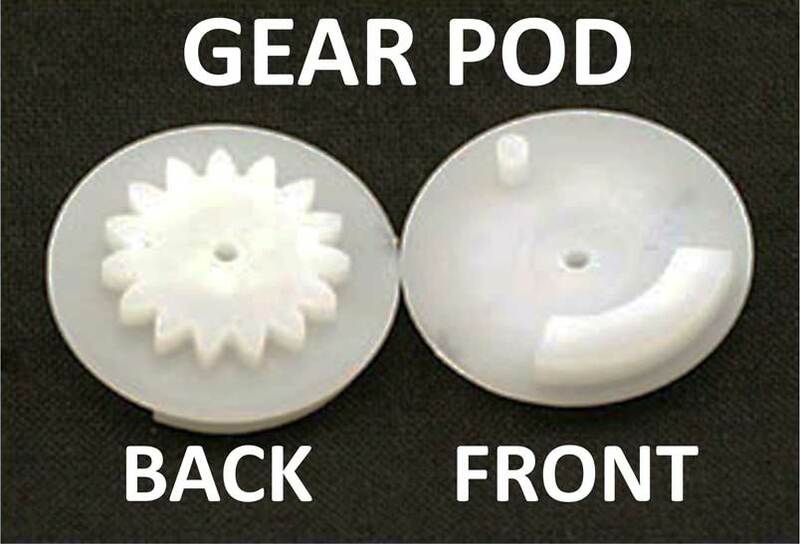 <<< On the back side of the original GEAR POD you will see a black 15 tooth gear. Examine it for damage also. A new replacement gear pod comes as one piece with that 15 tooth gear molded into the pod. It's a stronger part that way. <<< The small gear shown here (the white one) is the new 25 tooth gear that will take the place of the original 25 tooth gear that failed after years of driving. 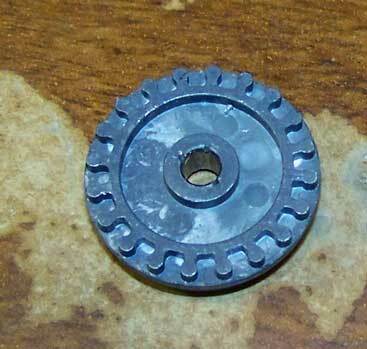 Finding a broken tooth as shown on that old 25 tooth gear is typical of this gear failure. <<< After removing your original GEAR POD, examine it closely. The gear pod is also known to fail, although not quite as often as the small gear. Usually, if the gear pod fails, you will find visible damage. If it looks undamaged, replacing it is optional, although I have been told by experts that If you want to better ensure a working odometer for years to come, you might consider replacing the gear pod at the same time. 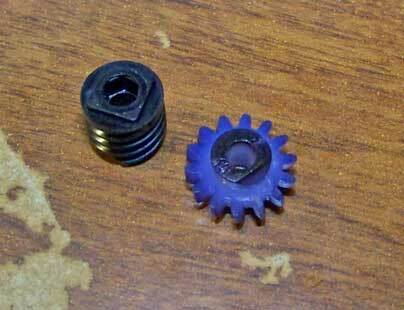 <<< I offer new small 25 tooth gears (left photo) and new gear pods (right photo). Click here or scroll down to the bottom of this section to find these gears for sale. <<< When reassembing your instrument cluster, pay special attention to places where your speedometer ELECTRICAL CONTACTS plug or insert into a receptical. If you miss something like this and the contacts miss their mark, you'll be wondering why your speedo won't work after reassembling. Look hard for small broken pieces. Use compressed air if you have it to help dislodge and remove any small bits of gear that might be remaining inside. "It was maddening. I agree, however, 7 times is simply a testament to my stubbornness, or so my wife would say! By the third evolution I could remove the instrument cluster in about 60 seconds and I had the rear wheel jacked up to facilitate a test drive!" "The giveaway was the trip 1/10 numbers would move a bit, then the upper main odometer would look like it was trying to turn, the numbers would move slightly, then it would all stop. It was behaving like a jam was somewhere in there. Your description of not giving up on your mechanical odometer gear troubleshoot was inspirational, I went back and re-read it after the fifth removal." Now you may finish re-assembling everything. Total time for this operation can be around an hour or less. 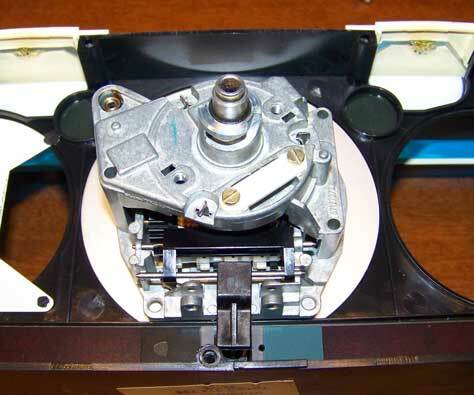 While I have not directly experienced this myself, I was told by a speedo repair professional that on a number of occasions they had experienced a "dead" odometer after replacing a broken gear in one of these VDO electronic speedos. The speedo function worked, but the odometer just wouldn't turn. On each of these occasions, the odometer would mysteriously start working after a period of driving . . . sometimes after an hour. Sometimes after a week. 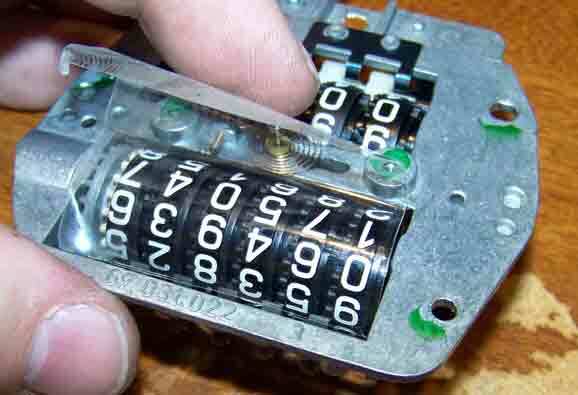 So far, no one has been able to say precisely why this happens, but it is generally thought that there must be some sort of circuit breaker protection designed into the speedometer circuit board that finally resets after a period of time. After I posted this information here, I began receiving identical reports from a number of customers who have installed new gears in VDO electronic speedos. So if this happens to you, you might give it some time and see if it comes back to life. If you have a similar experience, feel free to write me about it. 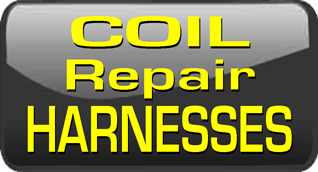 "Read your page regarding odo repairs and I have good experience in repairing most electronic VDO units of this type that use the 25t gear. They are found on Nissan Ford and Holden (GM) cars here in Australia and I also get the situation occasionally where the odo won’t work after changing the gear. What I do to fix it (99% of the time this works) is to reassemble the instruments into the car without putting on the plastic front so that I can get to the odo digits. 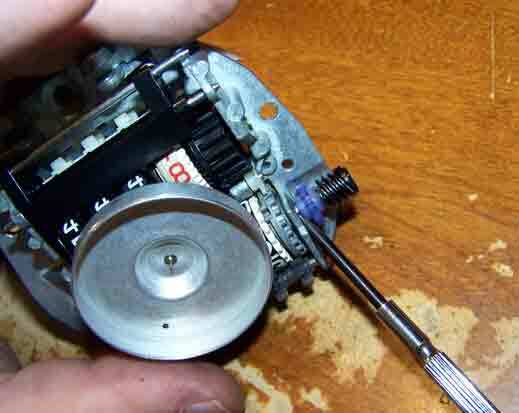 I have a 3/16th inch thick length of plastic (so as not to harm the dials) that I have sharpened as you would a pencil and whilst the vehicle is moving, I physically “attack” the odo 1st number on its gear cog (odo, not the trip), gently pushing it back and forth until it begins working. Then of course you can remove the instrument housing and put it back together properly. Usual disclaimer of course regarding fiddling whilst you drive is not legal!! 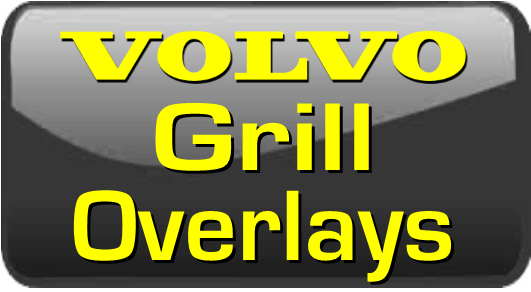 Hoping that may help the more impatient Volvo owner." And one customer found his odometer suddenly begain working again 15,000 miles after his gear replacement! "Speedo now works after advice from others on making sure the 4-prong connector on the upper right was seated properly with the pins going into the 4 little boxes. I then followed your tip and physically pushed the odometer numbers with a nylon bolt sharpened at the end while running it and after about 6 tries of wiggling the digits back and forth the odo and trip sprang to life! You should really add the info on the 4 prong connector. Thanks." And sure enough, there are occasionally some odometers that don't seem to return to life as one would hope. 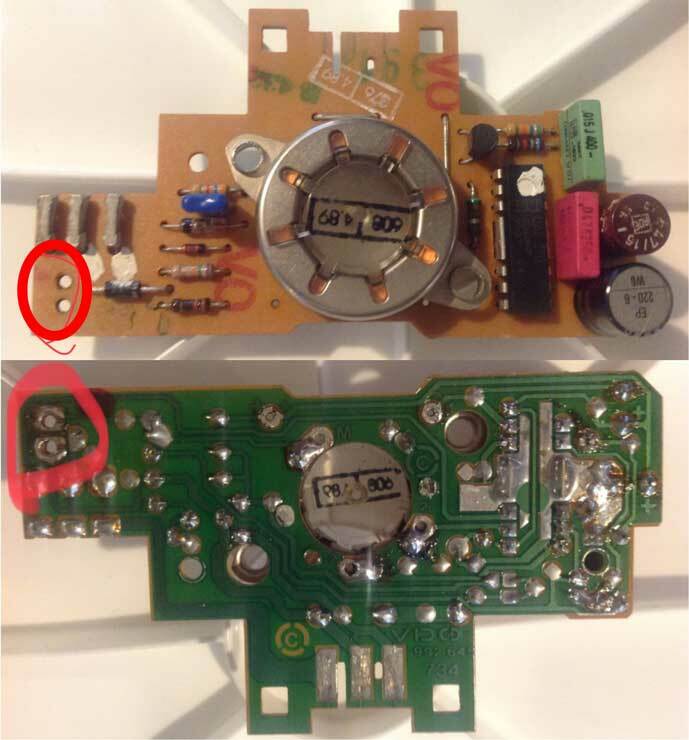 Some of these might be a result of bad electronics, such as a bad motor or other component on a circuit board. 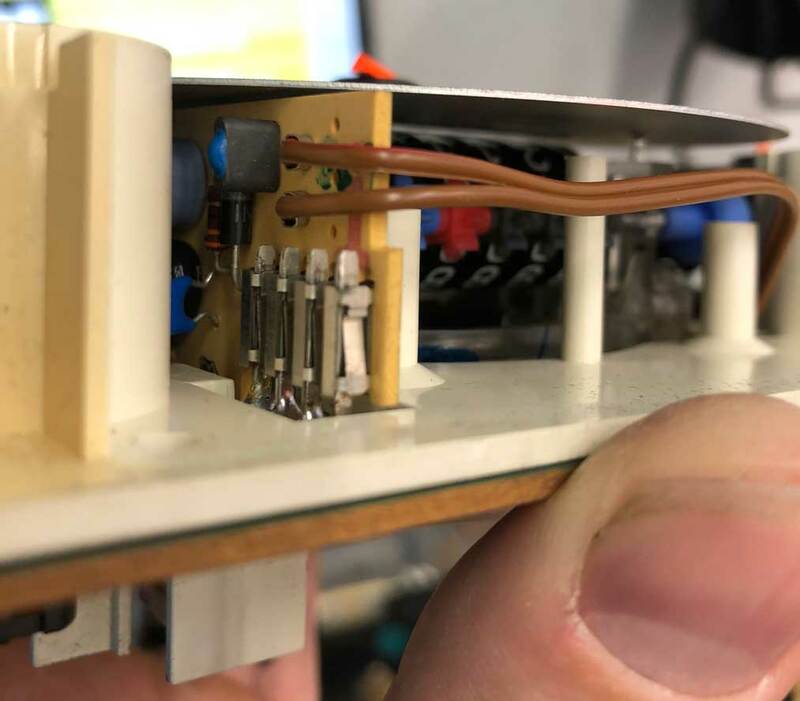 I know of a few that were found to be caused by a loose connection of the small electrical contacts inside the plug on the back of the speedo. After tweaking the contacts to get a better grip, things began working again. And a few others were thought to be very small cracks in solder joints (there are three) for the odometer motor on the circuit board. If you suspect a cracked solder joint, you might try re-soldering those joints if you have the tools for that. Otherwise, I'm afraid at this point I seems to have run out of answers, except what I might do if unable to make things work . . . such as searching for another used speedometer. "It CAN be done! 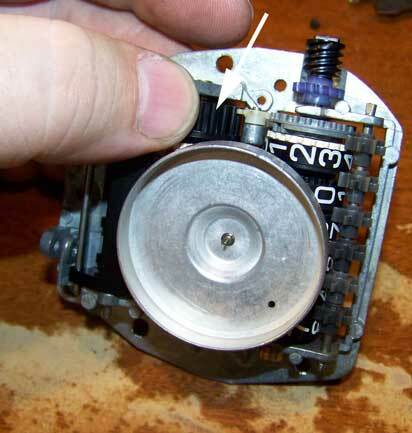 I just replaced my speedometer motor and needle shaft independently of the odometer. I am the guy who had the metal shaft of the speedometer needle motor shear while trying to turn it backwards like the write up says to. Unable to repair it, I ordered the cheapest matching cluster I could find on eBay. The replacement cluster I bought "as is" arrived and had a bad speedometer and odometer. I was pretty sad until I remembered the only thing wrong with mine was the speedometer needle shaft. Other than that, mine worked great. So I removed the speedometer from the "as is" unit, pulled straight up on the center round part of the needle (seemed the least likely way to break it) and it popped off without a fuss. Proceeded to break it down with gauge face off and side odometer motor off. Stared closely at it until I noticed 2 screws opposite the odometer motor side. Loosened them up. 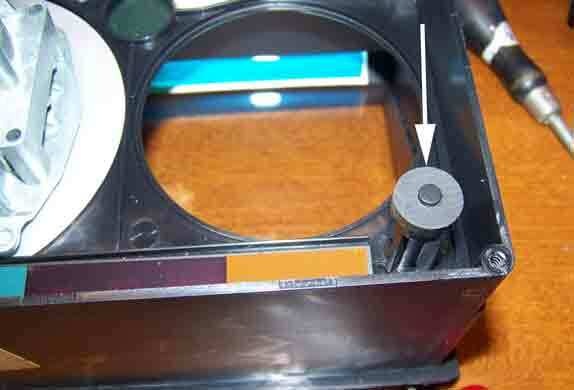 If you look closely there are four clear press tabs in the clear plastic housing for the speedometer motor. I used a small standard screwdriver and pressed them in and the motor was released, (this motor was bad on my new gauge cluster - weird) enabling me to swap the good parts from the bad unit to replace the bad parts on my good unit! Took it for a test drive and it works. Although I essentially paid 130 bucks for just a speedometer motor and needle, I still feel great knowing I can still watch my slug climb closer and closer to the million mile mark every day. This info can be added to the knowledge base in your site if you want. I'm sure someone would benefit from knowing your whole cluster isn't junk from a broken speedometer shaft and it can be disassembled completely fairly easy. If you are seeking to buy another gauge cluster or speedometer, here's a good discussion on what years may be compatible with yours. Chris A. suggested the possible need of replacing the speedometer circuit board if you cannot otherwise find the fault in your non-working speedometer. It's a much more simple procedure than one would think. The below information should be helpful if you need to take this route. As in all suggestions in my site, if you see something that can be added to or improved, please email. Tools suggested: soldering iron, solder removal (wick, solder pump, or both), and solder. 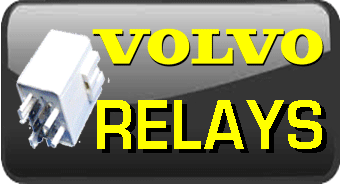 Known circuit board numbers: VDO 992645 145 without cruise control. VDO 992645 734 with cruise control connections. Removal: The procedure to access the speedometer board is the same as replacing the odometer gears, but with the addition of removing the board. In this photo you can see TWO WIRES (Blue and Black). 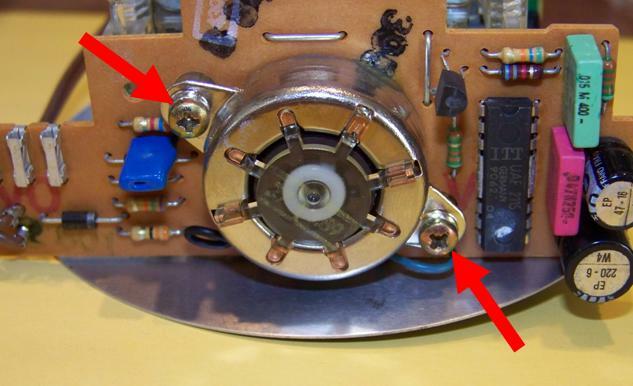 Using your soldering iron, desolder these two wires, keeping careful note which side is blue and which is black. It is always a good idea to take a few pics with your phone or mark wire locations with a marker. <<< If you have CRUISE CONTROL, your board will have these two brown wires. Desolder them from the board also. NOTE that one wire has a RED STRIPE. That is the positive lead. Be sure to mark this. Once all wires are removed, install the new board. Make sure to not hold the soldering iron too long in any location and to create good clean solder joints. There are good online tutorials on YouTube about proper soldering techniques. A common issue with accidental speedometer damage is caused by the tachometer RED/WHITE wire being connected to the cruise control taxi. Make sure to leave the RED/WHITE wire alone if you do not have a tachometer. 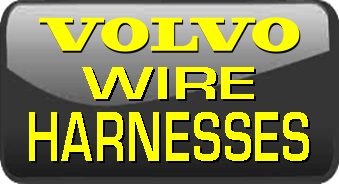 Many shops will see this orphaned wire and hook it up to what appears to be the right location, causing damage. As in all suggestions in this site, if you see something that can be added to or improved, please email.